Editor’s Note: For anyone living in an impoverished country, finding gainful employment to support oneself is a challenge. If that person happens to have a disability, the challenges multiply. 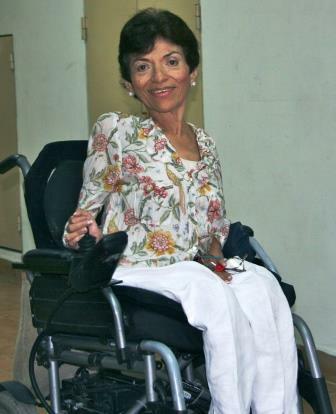 Eileen, herself physically challenged, was determined to find a means to help low-income people with disabilities and provide them with a stable income. She was the catalyst who organized a group through ACOGIPIRI (Asociacion Cooperative del Grupo Independente Pro Rehabilitacion Integral). 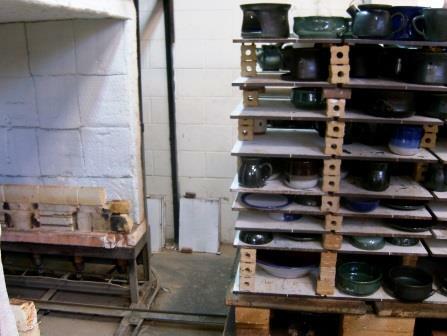 One of the group’s first roles more than thirty years ago was to develop what is still Shicali Ceramics, a cooperative that makes useful pottery and ceramics created on its premises by its disabled artisans. The products are highly regarded for their quality and sold worldwide in places including the fair trade retailer 10,000 Villages stores here in the U.S. Jobs give their employees dignity which is quite evident when seeing the pride on their faces as you walk throughout this facility. The downside is that due to slumping economies, sales are decreasing which concerns Eileen. Slumping sales mean adjusting employment from full-time to part-time for many of her dedicated long-time employees. This is hard for her and them. Eileen is an activist which is another facet of this group striving to educate and advocate for issues to improve conditions for the disabled. Eileen’s heart and soul mesh in this operation. She could have pursued her own art career, but instead has remained determined to stay with this pursuit she originated. My grandmother eloped with my grandfather at age eighteen. She died in 1992, but had lived in El Salvador all her life. [She shows us the Nettie Adams Smith family book that chronicles their history.] My mom was 24 and dad was 33 when I was born in 1949. My parents are both still alive. There were five siblings in my family growing up in a small city in Ahuachapan, the western most department in El Salvador located on the southeast border of Guatemala. When I was 20 months old, I contracted polio during the polio epidemic of the early 1950s. The polio vaccine had not arrived in this country yet, and I knew many people with polio but not as severe as my case. Many people had no resources for treatment. I was fortunate because my dad was a young physician and did research to make certain I got the best care possible. Treatment was a way of life for me. When I was thirteen, I went to the U.S. for surgery; I stayed for five months. That resulted in my losing a year of school. I also had treatments in Warm Springs, Georgia, at the same location as President Roosevelt. I had back surgery resulting in my being in a cast for several months. There was a group called Polio Survivors at that Louisiana hospital who got to know one another and formed connections. I lived with my brother and sister who were attending school at Louisiana State University. I never formally studied English but learned it through immersion. As a child I never thought about what I would do when I grew up because I thought I never would. I assumed my life would be short. Educational opportunities in El Salvador were extremely limited for disabled persons at that time. I attended school through the eighth grade. At age fourteen my formal education ended because there was no accessibility in my high school for wheelchairs. I never remember NOT being in a wheelchair. 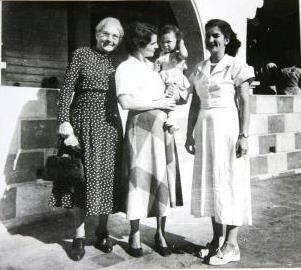 Eileen as a child with family members. From that point on I received private tutoring. Again, I was very lucky with my dad being a doctor that we could afford this continued private education which other disabled children could not. I had strong inclinations and interests in languages and the arts. I took private painting classes with a group of women. There were some French people in town who taught me that language. Later I began to study German. 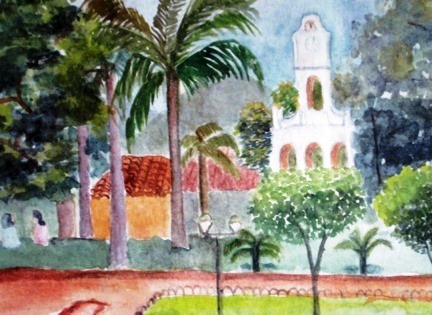 As my skills progressed, I came to San Salvador to continue studying German and painting. 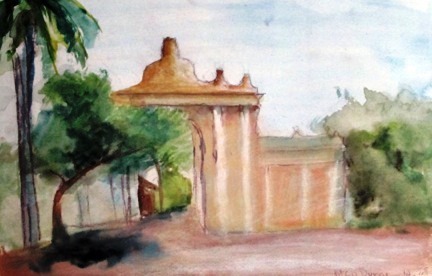 Watercolor print Eileen painted of a location in her hometown while a child. Being an avid reader, I enthusiastically read about the countries and cultures whose languages I was learning and art I was studying. This created a desire to visit those countries. I made my first trip to Europe with my parents and brother and returned to spend a couple of years with an attendant my own. I made subsequent trips and felt very much at home in Europe. There was a starkly different attitude toward disabilities there. Whereas growing up here in El Salvador, it was my disability that was seen first. People treated me with pity. For example, I used to like to organize parties and we hired musicians to perform. People would take turns staying with me during the dances so I didn’t have to stay alone. They never asked me to take part. In Europe I was regularly asked to “dance” and join in any activity anyone else did. Everyone was accepting and helpful. I was never cheated or threatened in Europe. Living throughout Europe was a wonderful opportunity for me not only to study and gain independence, but also be exposed to a broader spectrum of people and ideology. When I lived in Paris at a residence for exchange students for a year, I had the chance to meet people from all over the world with revolutionary ideas. I even met people from my own country escaping death threats who enlightened me to the political climate of the terrible things happening back home. This was the time before e-mail and cell phones. In fact, when I would make a trans-Atlantic call to my parents, it required waiting an hour for a response. At one point I applied for a UN position in Austria. It was a case where they published the position but already had selected the person they wanted in advance. I would be gone for up to two years at a time when I studied. But I was very attached to my sister and returned to El Salvador to attend her wedding. I believe if I had stayed in Europe one year longer, I would have never returned. Having experienced how things COULD be so much easier than they were here in El Salvador was a driving force behind organizing a group of my friends to improve conditions for the disabled. I had many friends who were disabled, and we talked together about how to create job opportunities for those who had no resources. We worked for two years to plan the organization that could be legally based. We were fortunate to find consultants to help us put our feet on the ground to help us realize our goals rather than have dreams that could never come true. None of us knew how serious or involved this task would be when we initiated it because we had no prior business experience or background. My younger brother was a strong supporter. We had all kinds of disabilities represented, from deaf to blind to physically challenged, and friends who were sympathetic to the idea. That is how ACOGIPRI, the cooperative began in 1981. A few years later the pottery was named Shicali. In the beginning we hired professionals to train the workers. Later the workers trained the workers. In the beginning I didn’t have as many responsibilities because there was a larger network of close friends who shared them. Over the years one by one various people got married or developed other interests that precluded their involvement here. I remained because I was committed to the workers and I would not and could not abandon them. They do such a great job and depend on this to survive. It cannot go on by itself. We had a lot of support from foreign organizations. During the war and post-war there were many more foreign sales than there are now. Foreign people were based here, brought friends who shopped here, and sales were good. As time passed they started to leave and that adversely affected our sales. So many things in addition to employment opportunities affect people with disabilities. Every day is a struggle. Our organization also works on advocating and lobbying for conditions on behalf of the disabled. Sadly not much has changed or improved. I get very angry to see that the average age of the artisans here is 42 and most came to us as teenagers. They never had a chance to receive an education. Many never developed a language to communicate with other people. And it is through no fault of their own. It is a state responsibility to provide these services. As a result, they cannot get a better job. Employers are afraid to hire them without those necessary skills. These people pay a high cost for not having that. There are job centers and agencies that handle job applications for disabled, but if you ask these people such as the deaf what the results are, they will tell you that very, very few get hired. They become so discouraged. I get upset when religious people see the disability is like a pain. I see it as a condition. I never saw it as a burden. It is a lack of accessibility; lack of consciousness. I become frustrated to see some inequities regarding the treatment of the disabled in this country. For example, those people who became disabled as a result of the civil war were afforded support for treatment of their injuries as a result of the Peace Accords in the form of health care, pensions, and technical aids. I find this unfair for those in the civil sector of society who may have lifelong disabilities and receive no government support whatsoever. The taxing system of our business here is also inequitable. If our income had stayed at the same level it was two years ago, I would have no complaints because we could pay our employees and our taxes. However, we are just barely surviving economically. The local government wants us to pay taxes at the same level. I am writing letters to try to explain that I understand we need to pay taxes, but now we often cannot pay these workers their full salary because of the drop in sales and this is their only source of income. Could they put us in a different tax bracket? I have to be careful because the local government could come and take this building away leaving all our workers with no chance to survive. We have never tried to promote our products from the standpoint that they are made by disabled artisans. Instead, we try to sell the idea that they are a high quality local product made by local people that is safe and very usable within the home. In the past we sold many of our wares in Italy, but their economy is suffering. The same is true in the U.S. due to the depression of economy. We have to find other markets and need more support. We try to keep our workers, but if they go, we are unable to replace them. For twenty-four years I had a relationship with a man which ended with separation. When that ended, I thought, how am I going to live alone? It was the best thing that could have happened to me because it gave me back my strength. I had become too dependent on him. I was 57 years old and starting over. Almost everyone gets older and develops some sort of difficulty. Sometimes I feel depressed because I have health issues to deal with. I had breast cancer ten years ago, and the thought of that disease returning never leaves you. I have a liver disease and need to closely monitor my diet avoiding certain foods. That doesn’t mean that I don’t still have dreams. I would love to travel to Bolivia. The people there seem to make a deliberate effort to retain their culture. Of particular interest to me are their native crafts which I would enjoy seeing because of my interest in art. 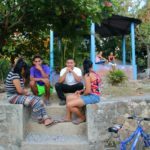 Other than maintaining our foods around the maize crop, we Salvadorans have become so highly influenced by America that we have really lost much of our rich culture and its traditions. I never lost my love for painting, and sometimes I wonder if I had continued to develop those skills if I would be a famous painter today. Some of the people who started at the same time I did have become famous. I may go two years without touching a brush, but I always return to watercolors and oils. I have a small coffee finca adequate enough to immerse myself in and make a living. I know I have accomplished much in my life. Establishing the cooperative here brings me great professional joy. In 1978 when the whole venture began, most disabled persons remained at home their entire lives. Much remains to be done. Being able to travel around independently brings me much personal joy. I was raised Roman Catholic, although I am not practicing. I do a lot of Bible reading as well as Oriental meditation. These things remind me that our lives are transitory. “YOU DON’T HAVE TO WALK IN ORDER TO FLY”.